If I’m not traveling for ministry, my Saturdays all look pretty much the same – visiting my 93 year-old father who lives in an assisted living environment, taking him to Marshalls or Ross, a vocal work out and then home to do my household chores. However, this past Saturday, my boring routine was interrupted by an amazing experience in the parking lot of Walmart. I was rushing to pick up several things for my dad when I saw something that made time stop for a few minutes. It is still surprisingly warm for October here in Salem so when I arrived at Walmart, the sprinkler system which waters the flower beds in the parking lot was on full blast completely flooding one particularly large flower bed. 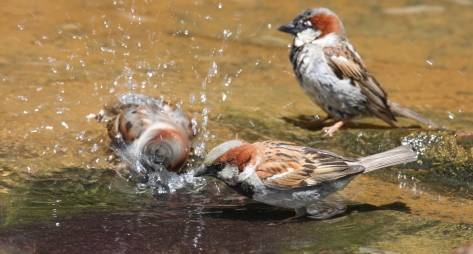 As I parked the car, the sprinklers turned off and within seconds, thirty or forty little birds that had been up in a nearby tree descended into the pool of water and went completely nuts splashing around as if they had never seen water before. I was transfixed by the number of birds that participated in this public bathing extravaganza, but what really captured me was their unbridled joy. What a pleasure to see a moment of absolute truth. I”m so sorry I didn” t have my camera with me. Those little creatures were so involved with their joyful play that they didn’t seem to care that I had approached them and stood so close that my pant legs got wet from all their splashing. It was one of the most amazing things I had ever experienced. Much later in the day, I still felt a spring in my step as I vacuumed the living room and remembered those little birds. It never ceases to amaze me the joy I derive from nature. Before church yesterday morning, I took a leisurely shower and as I recalled how much those sweet little birds enjoyed their bath, I decided my morning needed to start with a little dance of joy in my own shower. It was great fun and it colored my whole day. A word of warning however. If you decide to do our own dance of joy in the shower, you might want to lay a few towels on the floor. Shower-joy is a wet business. HA! !